The same misinformation we embraced last century continues to mislead new generations through shows like Wild Kratts: Voyage of the Butterflies . In this episode, a spider cuts a monarch from its web, refusing to eat the milkweed-laced butterfly…essentially spinning science into science fiction! While I can’t argue the show was entertaining, I’ve already heard this misinformation repeated from several of its young fans. While nature’s truth may not always be pretty, it must be told if monarch enthusiasts across North America want to effectively increase the struggling monarch population. Plant placement can reduce predator traffic. Monarch eggs and caterpillars on single milkweed plants often go undetected…so do plants in partial shade. In our northern climate, we have several ant species in our garden and I’m sure they eat some monarch eggs and caterpillars. However, they have not proven to be a nuisance so we leave them alone, as we do with many insects that butterfly gardeners consider pests. If your garden pests are innocent until proven guilty, a healthy ecosystem should develop that can support both monarchs and their predators. Mix 1 Tbsp. of powdered sugar with 1 part baking soda. The powdered sugar attracts them, and the baking soda disrupts their digestive tracks, eventually killing them. Place the mixture in jar lids near the plants they are invading. outdoor liquid ant baits– these weatherproof baits by terro are stuck into the ground so they’ll stay in place during stormy weather. Ant-killing borax is the main ingredient. These pre-mixed baits are cheap, convenient…and they work! A prime example of why you should avoid biological pest control…there are usually unintended consequences! Relocate monstrous mantids to less butterfly-friendly plants. note: yellow jackets aren’t the only predatory wasp attacking monarchs. 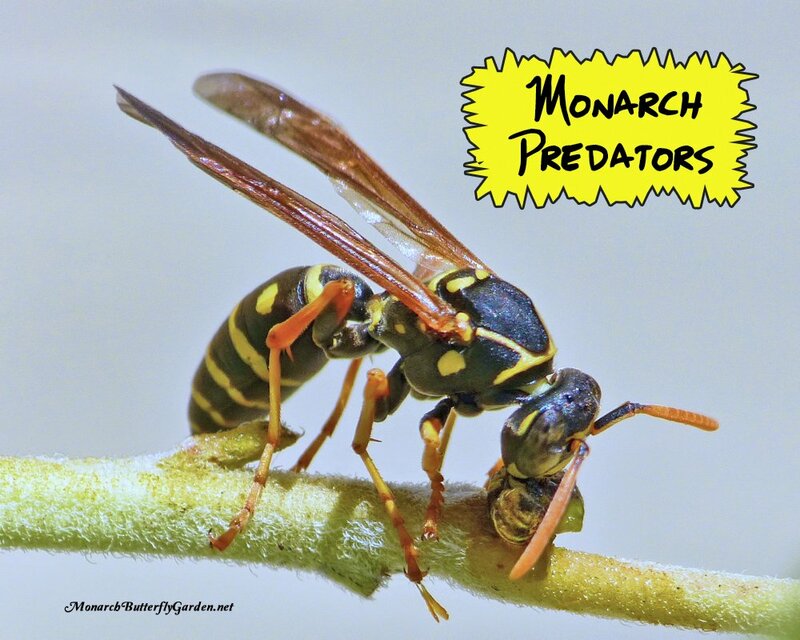 Paper wasps are the worst monarch predator in our northern garden, on constant patrol for monarch caterpillars. Wasps are an issue for monarchs across the globe, from the US to New Zealand. 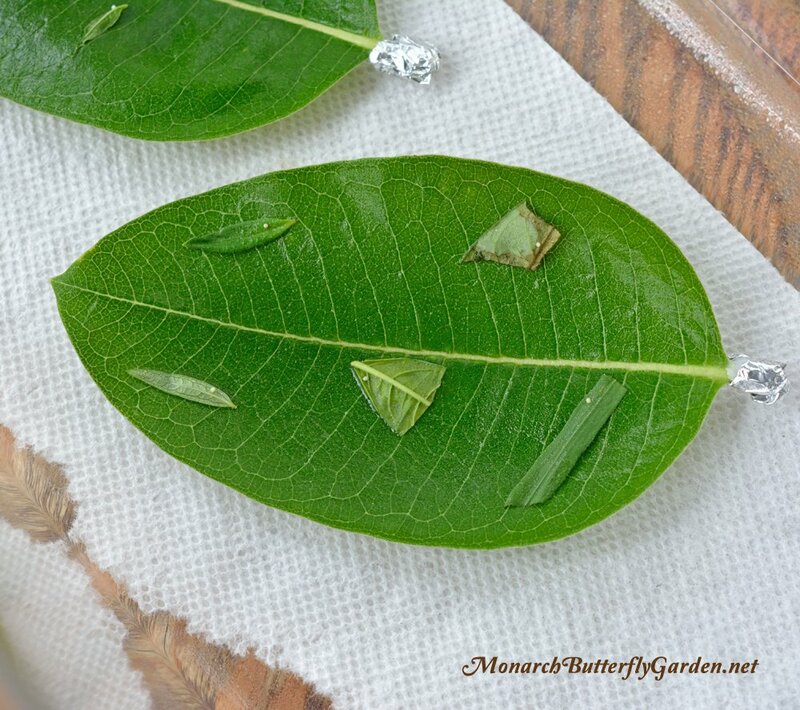 If you raise monarchs, they need at least 3 hours to dry their wings before they are released. If you want to learn more about how to safely raise and release monarchs, check out my raising resources page. If you’ve read other articles on this blog, you know I’m a proponent of nurturing a healthy ecosystem which includes monarchs and their predators. Wasps are always welcome in our garden as beneficial pollinators, but unfortunately, their children have to eat…caterpillars. If you watched the video above, you might have have vowed to keep your garden wasp-free. I’m here to tell you that’s not possible or advisable. However, that doesn’t mean you need to host wasp nests on your property. We removed potter wasp nests from the bottom of a common milkweed leaf. We also had a paper wasp nest on our house, conveniently built right above one of our milkweed patches. If this happens to you, you can sacrifice most of your monarchs or you can take down the nest when it’s dark, cold, or raining…do this early in the season before the population explodes. Last season we sprayed an underground yellow jacket nest in our raised beds. We sprayed early morning during a light rain, and I never saw another wasp emerge from the nest. A good way to deter wasps is by placing 5 Gallon Paint Strainers or Mosquito Netting over your milkweed. You can use tomato cages for extra support. This will keep them from snatching up your poor, unsuspecting caterpillars. 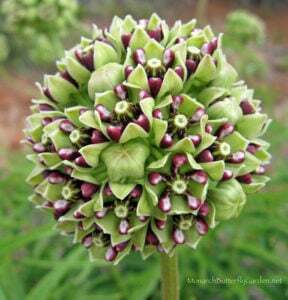 This idea works best for potted milkweed plants. Spiders are the kings and queens of camouflage. They are usually hidden from sight and will feed on your small caterpillars at night. Also, if you raise monarchs on potted plants or stem cuttings with buds/flowers, it’s easy to unknowingly invite spiders into your raising cage. If you consider that spiders feast on most of the other pests in your garden, I’d suggest keeping them around. If you have a limited milkweed supply, consider removing any spider webs that have been formed on your milkweed plants. You can’t (and shouldn’t) save all monarchs if you want to maintain a healthy ecosystem. However, bringing a few indoors to raise can help boost their low survival rate…less than 5% outdoors! If you decide to bring a few in, feed the caterpillars stem cuttings without flowers/buds or serve single leaves. If you raise monarch butterflies, make sure you don’t place monarch eggs too close together. After a newborn caterpillar hatches, its first meal will be the nutrition-laced egg shell. If other eggs are in the vicinity, the hungry little caterpillar may wander over to an unhatched neighbor for seconds. The same is true when placing newborn caterpillars with large ones. If they are competing for the same milkweed leaves, the large caterpillar could eat the competition for lunch…or dinner. In the hatchery, I space eggs out so newborns won’t find unhatched siblings. When caterpillars hatch, move remaining eggs to other leaves. To prevent cannabalism of small caterpillars, make sure you’re raising them in a large enough caterpillar cage, with plenty of milkweed available. More Monarch Predators Coming Soon! My Girl Scout friends and I raise Monarchs for the girls to release. We live in South Florida. A couple of us notice a few anole lizards/geckos in our gardens and have wondered if they are also eating caterpillars. I couldn’t find anything on the internet that says that they are also a predator of Monarchs. I witnessed a wasp sucking the juices out of a caterpillar as it hung from it’s mouth. I was shocked and didn’t take a picture of it. I wish I had. yes, some species of lizards also eat caterpillars. Predators are a part of a healthy ecosystem, but not a fun thing to witness in the garden. HELP! I noticed small black bugs on my Monarch chrysalis and thought they were ants. I removed them and realized they could fly so did some research and have found they are Chalcid Wasps. These things have impacted a good 15 Chyrsalis and not sure what will happen to the remaining 12 caterpillars still enjoying milkweed. I cannot find any info on internet on how to get rid of these bugs. – can you help? Also, should I remove and destroy the chrysalis that appear to be infested? I am sick about this; been successfully raising/releasing Monarchs and have never had an issue with these horrible pests. Appreciate any input – thank you!! Hi Cyndy, they lay eggs on the soft chrysalis so they’ll wait for your caterpillars to form theirs. You need to move the caterpillars to a temporary habitat and then rinse out their current one to make sure there are no wasps inside. If these are just outside in your garden, you could always bring a few inside to raise. I live in Christchurch New Zealand and we have started trying to foster Monarchs in our garden this year. A few weeks back, overnight all but a few of my caterpillars disappeared without a trace. We did have some rain so I thought maybe that had something to do with it. However, yesterday we had 40+ caterpillars, all on the last two plants with leaves. When I went out this morning, both plants (in potting bags) have been pushed over onto the ground, some of the leaves have come off the plants, suggesting some kind of struggle, and almost all the caterpillars are gone! I only found three survivors on the stalks of eaten plants nearby. Any idea what could have happened? We do have a cat and a dog, but I didn’t think they would touch them (although I did feed the plants with some fish, blood and bone, which in hindsight may have piqued their interest). I’ve relocated the two plants to on the deck right outside my bedroom so I can keep watch. I’m devastated (as will my daughter be when I tell her). We’ve had well over 100 caterpillars, and only one has made it to become a butterfly! PS…I’ve never heard of a dog/cat eating dozens of caterpillars. they would probably get noticeably sick if this occurred because of the toxins in milkweed. Where can I find monarch butterfly’s or get eggs or something like that? I manage a Native Butterfly House in Maryland (30’x50′) The house is covered with mesh, but the holes in the mesh are large enough for the small Chalcid Wasp to get through, and we do not have it in our budget to replace the mesh at this time. The wasps have been a real problem in our house; this past year they killed all of our butterflies towards the end of the season (getting into the chrysalis). I was wondering if you have any recommendations? My milkweed. has like a web type film on it. It is on the native and balloon. What is the best way to get rid of this. Question about paint strainers to protect caterpillars. If I use these over plants, won’t the butterflies be unable to lay eggs? On Balloon Plant, I wrap a 2-inch section of the bottom of the stalk with masking tape then use a craft stick to spread Tanglefoot on the masking tape. An ant or two get stuck before the other ants give up. No ants, no aphids. Thanks for the great technique! I have one butterfly weed plant (tuberosa) which to my amazement this year had about 10 monarch caterpillars on it. The property across the street from me (which is owned but has no buildings on it yet), has approximately 15 tuberosas on it but not one monarch caterpillar. If this happens again next year, should I move some of my caterpillars onto the plants next door? I live in San Diego, CA. I’ve breed monarchs this year by accident, when I bought a couple milkweeds and plant them in an outdoor area. This area is somehow protected but it’s still an outdoor area. I think the success rate of survival has been around 70%. I clean every morning and night some spider webs and that has help keeping spiders away. The #1 predator I have deal with have been flies. They hatch eggs on top of the caterpillars and eventually kills it before they become chrysalis or even a couple days after. I installed a fly trap and it has helped but still is, once in a while impossible to control. I planted milkweed this summer and have monarch caterpillars on the standard milkweed. I’m not finding any in the dwarf milkweed. Is the dwarf so different they won’t use it? Hi Chelsea, many times ‘scarred’ caterpillars turn out to be fine and the scar does not transfer to the butterfly…all you can do at this point is separate and monitor. good luck! I love Monarchs, I hand reared and released over 250 from Eggs about 5 years ago but did not seen any At All for the last 2-3 years. This year I was able to raise and release 50, how long do you think it is going to take to get them back to where they were before we lost 80% due to the Freeze? yes, anoles will eat caterpillars, chrysalides, and butterflies. I need some tips on controlling Tachinid flies. I have lost all my caterpillars, the last two years, to these pests. I have not put out any milkweed this year because of this. I would like to try but am afraid they will all die again. Any suggestions will be appreciated. Ok this is my first year to attract Monarch Butterfly’s and the Milkweed I purchased in the fall is almost 6 ft tall and I have at least 12 caterpillars crawling on them as of today. Now what I can’t find an enclosure tall enough and I don’t want all my caterpillars to die ..,can you provide me step by step best solution to the most positive outcomes? I am so confused with all that I am reading on here ..cover with nets, put in container or jars .,no water or they will drown..? Help ..tomorrow I will research to see if there are any local Monarch professionals to help me make my endeavor successful, I really want to help ! The eggs in my breeding tent are not hatching even though I saw the female had bred with the male for hours. Instead they are turning clear and I’m getting no caterpillars. Is something in the tent sucking them dry? Plant is healthy and getting water everyday and I can’t find anything inside. Help! hi Sue, males need about four days before they can mate…it’s possible he wasn’t ready. I have several common milkweed plants that I planted on my property. I have successfully raised several monarchs, but my plants are covered with aphids on the underside of the leaves. Do these harm the eggs and/or caterpillars? If so, do you have a suggestion for getting rid of them? I also have many wasps on my plants. Would they be eating the aphids? 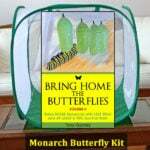 I bought your book on raising monarchs. Thanks for the many useful tips. I take a small make-up brush and brush the aphids off the leaves of my Milkweed plants. The aphids see mto destroy the Milkweed leaves by sucking the fluid out of them, and the leaves turn yellow and then brown. It is best to brush them off so that you will have healthier plants. I have tried spraying the plants with water, but I think the brushing method is more effective. (If you see an egg while you are in the process of turning the leaves over, you can save it. (The eggs are white and about the side of a pin head.) Most Monarchs lay their eggs on the underside of the plants. However, I have seen a few eggs that were laid on the Milkweed flowers. I can’t tell you how glad I am to have found this website. Tremendously helpful information from Tony and the commentators. Thank you. We live near the Delaware coast. A couple of decades ago, when one drove the coastal highway in autumn, you’d see hundreds upon hundreds of migrating monarchs. In recent years there have hardly been a few dozen. We’re doing our part to encourage a monarch comeback. Have planted lots of milkweed in the last few years and right now not only are we seeing many more flying monarchs, but have perhaps 50 caterpillars of various sizes that I can spot. Our property is completely pesticide free, and is full of praying mantises, wheelbugs, lacewings, and other generally-beneficial insects. 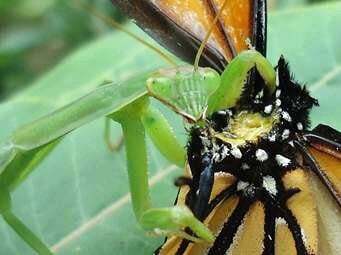 I was startled to learn that the praying mantis is a predator of monarch caterpillars. I knew wheelbugs would likely kill them, but the wheelbugs are the only thing we have that kills destructive Japanese beetles, among other pests. Will these predators not attack a monarch caterpillar once the caterpillar has reached a good size? Hi Perry, unfortunately large caterpillars aren’t safe from predation either. Bringing a few indoors to raise or maybe covering some plants with netting outside could make a difference…good luck! Thank you Tony. I’ll try covering the outside plants with netting, as you suggest. Our milkweed is at least six feet+ high. I do a daily morning census of the caterpillars ( I miss so may that I see later on) with my Doberman, while he attends to other things. It’s a joy to see so very many more caterpillars this summer. But how do I let the big caterpillars escape the netting to pupate? As a side note, we grow a tremendous lot of bronze fennel and have countless black swallowtail caterpillars and butterflies. Stupidly, before I knew what they were, I gathered these caterpillars and moved them to a remote part of our property thinking they were destructive. Now I’m thrilled to see them everywhere on the bronze fennel and never move them. Let them eat! We still get the summer/autumn seeds (great for your breath) and the wonderful late summer flowers. Also, I’ve learned from your site about the attractiveness of tulip poplars and black cherries to tiger swallowtails as host plants. We have many of both species of tree and superbly gorgeous swallowtails in both their yellow and dark forms. I am so confused. I planted swamp milkweed at my new house this spring. Today I have 4 huge plants, monarchs, eggs, and cats. I decided to take some inside, but I’d never done this before. Did TONS of online research. This morning I had three eggs that had turned dark, and through my cheap phone magnifying glass app, it looked like the pics online of soon-to-be-hatched cats. Each egg was on a tiny piece of leaf I then placed on a fresh leaf. I had four small plastic containers — each with one egg (one is likely newer than the others — it was still white/cream colored). I placed a window screen on top of all four — it rested securely over all four. After work this evening — now — those three darker eggs look like flat silvery circles — sort of like marks where the eggs were. There are no chew holes anywhere, and I cannot find any caterpillars . I looked through the magnifying glass with a bright flashlight. I cannot find any at all. It looks like the cats hatched, ate most of their eggs, and then crawled away through the screen holes (I assume they’re small enough). People (and the internet) tell me they don’t do that — they stay on the fresh leaf. But I cannot see them anywhere — I’m looking for the black heads. It’s so bizarre. I’ve watched videos of brand new cats. I really think I *could* see them, especially with the magnification. My home is quite clean and bug free. I can’t imagine they would have been eaten by something. Is it possible that they crawled away? Is it strange that I still see the silver of the egg? Is it possible they’re still munching on it? That I just can’t see them? One friend tells me I’ll have tiny surprises tomorrow afternoon, but I’m very dubious — and worried that I lost all of them. I have three more good looking eggs in small containers. Should I put lids on the containers instead of the screen? Any help appreciated!! Thanks Tony. Apart from not spraying with water — and not covering with a full lid — I did everything “right.” And only on your site have I read that they should be sprayed. Are water and a full lid that critical? Is it possible that some parasite or bacteria got them? Thanks! Trying hard to understand. Hi Amy, you will hear conflicting info about whether they need water but I believe it’s essential from what I’ve seen over the years…however, too much moisture and bad air circulation can promote disease. As for a lid, most everyone agrees on that. Without a secure lid caterpillars can escape and predators can enter. Thanks again! I just successfully hatched 6 new babies! This time I put lids on with a couple tiny poked holes for air. My best guess is that the first batch I lost crawled out through the holes in the screen. I did find two of the brand new ones on the underside of the lids — telling me it’s certainly possible for t hem to wander away from the plant. So far the 6 are in good shape. Amazing how teeeeny tiny they are! I found one Monarch Chrysalis that is for sure infected with Chalcid wasps and one that I am not sure of. I have been raising monarchs for three years now and built a hut that I rotate my milkweed in and out of as demand calls. The bottom is open to the ground but the mesh is very small. I have not ever had issues with these wasps before. I am not sure what to do with the infected chrysalis and how to watch and remove these wasps. I had ten butterflies emerge on the same day so I had the door open so they could fly out. I don’t have any other wasps in there now and I have changed out my milkweed for the new batch of cats. Do you have any links or advice that would be helpful for the chalcid wasp and identifying the affected chrysalis? Now that they have found their way in, you will have to reinforce the cage or try something else…good luck! Hi! I started a butterfly garden just this year. Imagine my excitement when I discovered 5 monarch caterpillars! They grew so fast. Then I started to see new smaller ones. Last night I went to check on them, and again his morning. There was only one large caterpillar!! Three small ones too, but the others were gone! What should I do?! Cover them? I did see ants on the plant the day before but didn’t think anything of it. I will put coffee grounds around today. I began a butter garden 1.5 months ago. Everything was going well then this week I have found 5 dead monarch caterpillars. 4 dead monarch chrysillis they were black and gooie on the inside. One of my gold rim swallow tails began to emerge then never finished and died. What could be causing all of this. I still have 11 monarch chrysillis and 4 gulf frittilary chrysillis that are looking healthily. Are they also in danger. The last two days I have seen my resident catbird go after monarch butterflies which are attracted to my liatris. Yesterday chased the bird which had the Monarch by the wings and was hitting it on the ground trying to kill it. It flew away to a younger catbird. Both flew away as I got closer to try and release the Monarch. Today the catbird flew into my fenced in area for liatris to get at a Monarch. I chased it away..
Hi Mike, sorry to hear you have birds that are going after the monarchs…I found a recent bird victim in our Minnesota garden, which is a rare occurrence up here. I have bugs that are red and black, mating like mad and are all over my milkweed. we have a ton of plants yet no caterpillars or chrysallis. I thought that the consumption milkweed by the caterpillars was precisely a deterrent for being eaten, along with their colour? This is a huge evolutionary flaw. Hi Felipe, perhaps our perception of the relationship between monarchs/milkweed was the flaw?? Western Fence Lizard question: We have a Western Fence Lizard who spends each day sunning on a rock next to our habitat. Does anyone know if fence lizards eat Monarch caterpillars? It may be that as soon as the caterpillars decide to climb down out of the planters to find a suitable place to metamorphose, the lizard gulps them down. But do 5th Instars “go walkabout” to find a place to transform during the day, or at night? I’ve been trying to figure out why I don’t have so many caterpillars this year and I have come to the conclusion that because I have so many of these fence lizards in my yard that they are eating the caterpillars. I hope that some big birds in the neighborhood will continue the circle and bring down the population. I brought in several milkweed leaves with eggs. One hatched 3 days ago and the other eggs have disappeared. The caterpillar is eating the leaves. Is it possible that he or she ate some eggs as well? Hi Cathy, eggs should be spaced apart to avoid this…yes, it is possible. I would double check to make sure you didn’t miss a caterpillar or accidentally bring in a predator. good luck! I have been raising monarchs for two years. I have made a large butterfly house covered with screen that I keep a fresh milkweed plant in and transfer newborns/babies in as I find them around the yard. I had 2 chrysalis that had formed on top, but last night something actually bit through the screen in 3 places and ate the chrysalis and a cat. The holes are no bigger than 1/2 ” . What could be biting through screen? Also several of the cats have discolored and died just before they pupate. What causes that? Hi Sue, I didn’t realize some predators chewed through screen too…with such a small opening I would guess some type of lizard, if those are in your region. Years ago I had a wasp chew a hole through window screening to get to a chrysalis. The caterpillar made the mistake of making its chrysalis on the screen. I then remade all my all of my wood frame cages with screening on both sides of the wood. It never happened again. The wasps also would follow the caterpillar as it crawled on the screen but it couldn’t reach it. I too have a large screened “cage” this morning I found 3-4 holes chewed & am missing a dozen chrysalis, found pieces scattered around. I’ve been using this cage for 3-4yrs, no problems. I have seen a large praying mantis on cage, of course I moved him, but ……… I am re-screening with aluminum screening material right now. I was googling to see if anyone had this problem!! Just to confirm something you said about predators adapting to the natural toxins in milkweed, and in particular, the video in which a spider “evicts” a Monarch caught in its web, a spider in the yard next to ours constructed a huge web this week (around 2 feet in diameter), and caught and consumed one of our Monarchs. I took a photo of it, but see no way to share it here. We are trying to raise monarchs. We have two 5′ tall milkweeds with huge leaves. I watched a female lay many eggs and in a short while there were at least a dozen newbies on each plant. They were growing rapidly. We left town for three days and when we came back every single caterpillar was gone! Now we have half chewed milkweed plants and no babies. Will there be a chance for more eggs or is it too late in the season (Ohio)? Would love to see more and when they hatch I will incarcerate the little boogers until they are able to survive on their own. Did you try searching for them with a light at night? I’ve noticed that our cats “lay low” during the day – especially if it gets really hot – then come out at night to feed. Even then, they will often feed underneath leaves, so it takes patience to spot them. Hi Rob and Mark, you might also try searching after a rainstorm when they travel topside to drink water droplets. I live in north Ontario, and as a kid would raise dozens of monarchs every year with a huge success rate. I haven’t seen a cat in 20 years, however, despite intense searches. I desperately wanted to let my son carry on the tradition, and this year I actually found one! I couldn’t bring him inside right away, until I buy him a proper home, but have checked on him several times a day and checked every leaf to make sure he was as safe as possible. I will finally be getting his home tomorrow, but I’m not sure if it’s too late. Yesterday he was big and healthy and pigging out on his milkweed, but today it looks like something attacked him last night. He’s got a few thin scratches around his head, but not deep enough to really hurt him, I thought. But he easily fell off the leaf when I turned it to check on him, and hasn’t eaten all day. Nor has he spun silk to latch on to a leaf. I’ve brought him inside and he looks rough. His head is slightly turned to the side and he isn’t moving. When I brought in a fresh leaf it seemed to wake him up, and he looked to be drinking the milk the leaked from the stem. However, it was short lived and now he is once again non responsive. I know it’s probably over, but I have to at least do everything I can to try and keep him going. So, any ideas and suggestions are hugely appreciated. He’s an instar 4, if that helps! Are there any insecticides that are safe to sprinkle around the base of milkweeds to keep ants off? Something that won’t be taken-up by the roots. (I know anything “systemic” is out) Sevin dust, maybe? Cornmeal treated with Malathion or Diazinon? BTW, Japanese beetles are especially awful this year. Hi Bob, keep in mind that caterpillars crawl off the milkweed to form a chrysalis…I wouldn’t use any pesticides by your milkweed. That’s a good point. Thanks. I’ll try the coffee grounds mentioned above. Although… we are collecting the eggs every day and hatching them (and feeding them) in the house, so if the coffee grounds don’t work insecticide might be okay if I’m *very* careful. It sets a bad precedent, tho’. Had a cat go into a j hang then went limp and deflated. silk coming out its sides. 24 hrs after J hand and not chrisilided(?) Any ideas? I heard a rumor that petting a dog that has been tick medicated can kill them . Is that true? I’ve had great success raising Monarchs in San Diego. Occasionally, I bring my parents (who live in the LA area— Encino, Ca, to be specific) monarch caterpillars. My parents have been complaining that the monarchs have been disappearing, and on two occasions I found a caterpillar body with a bleeding head, as if a predator attempted to eat it, before quickly rejecting it. They also had a chrysalis at one point which completely vanished off of its hanging location on the outside of their house. Any thoughts on these unfortunate deaths, what is consuming or killing them, and how it can be avoided? Off of the top of my head, a few fauna that my parents have that I do not have (or have to a lesser degree) in San Diego are the tree squirrel, scrub jay, Bewick’s wren, California towhee. Hi Daniel, hard to say, as many predators eat them…regardless, you can always try covering plants with mosquito netting or bring some indoors to raise, which you already are…a healthy ecosystem contains both monarchs and their predators. I had 3 caterpillars on one plant and 2 on the other. I have not seen any of them in the past few days. I haven’t seen any wasps around, or ants, just a small yellow spider that I put in another garden far away from the milkweed. Could something else have eaten them? I live in Western NY, so no lizards, or frogs are around. They were all quite large, 2-3 inches in length. Thanks! It’s not BAKING soda and sugar to kill ants, it’s WASHING soda … aka Borax. And you shouldn’t put it out anywhere that pets can get to it – it’s also fatally toxic to cats, dogs, and other animals. I’m so happy I found this site, I’ve learned a lot! I’ve been growing milkweed for 3 years. This is the first year that I’ve gotten wonderful, sweet smelling flowers. I’m not the only one who loves the smell, they were covered with ants and I complained to my husband while writing borax on the shopping list. I’m sure you already know where this is going, so I’ll cut to the chase. He used small grains so I used the dust buster on plants and ground. Twice. Then I sprayed the plants off with water and have been soaking the ground ever since in the hopes of diluting the poison so the plants don’t soak it up with their roots. Do you have any other suggestions? I’d hate to have to cut the plants down, but I also don’t want a female to waste her eggs on something that will kill the cats. Hi Mary, if the plants seem ok after removing the borax from around them, I would leave them. It sounds like you’ve done everything you can to get the area cleaned up…good luck! and good luck with your chrysalides! Hi Meme, hummingbirds eat small bugs and sip nectar from flowers…they are not the culprits. Yes, netting sounds like a good option for your situation! Let us know if that makes a difference! Hi Meme, it’s possible they are just molting, and will return to the milkweed when they are finished…or if they’re big enough, possibly ready to pupate? Meme, we used pvc pipe and made frames over the plants and covered the frame with butterfly netting. That worked great. I had a milkweed that was covered in Monarch eggs. I noticed that there was an asian ladybug on the plant. The next day, all of the Monarch eggs were gone. Do domestic and asian ladybugs eat the eggs of Monarch’s? Great blog and info Tony. I’ve been ‘raising’ monarchs and growing my own Milkweed for sometime now in Central Florida. For anyone wishing to make a difference in even a small way, get or make an indoor enclosure. I’m presently over 90% egg to released adult butterfly if I get my hands on the egg or the cats. 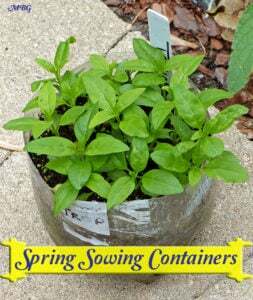 I use a stagger pot planting of various sizes and in a few areas around my home. While it is amazing to watch the monarchs feast on the nectar when they stop by, I get very few eggs from those plants…..you can see where a 1st instar has been nibbling, I rarely find them. What I have found is placing my smaller Milkweed plants (now in 16oz solo cups) on a table away from Milkweed with flowers and creating another area for the egg laying females to do their thing. Then usually I quickly take the leaves with the eggs or cut the young Milkweed back (which promotes growth and more shoots too ) and bring them inside to my enclosures. Get an enclosure and your survival rate greatly increases. good advice Rob…thank you for sharing your experience! This is my first season raising monarchs and I’ve learned a lot from your site. Since these plants are already tall, should I just cut them down and put them in water bottles to encourage rooting and then plant them in solo cups? It looks like I’d get 3-4 good cuttings to root and the remaining plant that’s in the pot. I’m in NE FL & our summer will last until mid November. What’s the best way to plant rooted cuttings in a solo cup? Hi Donna, you can put stem cuttings in water or root them directly in the soil. Up north, we root in water more often because we typically root 1-2 months before planting in soil is possible. You can place cuttings in solo cups. good luck! I had probably 50 2 week old cats on 2 milkweeds,. One milkweed was covered by a tomato tent from Gardener’s supply. I decided to remove the cover and the next day they were all gone. I am sick. I should have left them under cover. So sorry to hear this Rita…either predators got to them or they crawled away to find more milkweed. 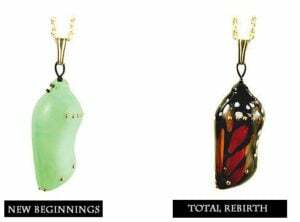 2 plants can only sustain about four caterpillars to the chrysalis stage. Hi Meme, it sounds like a potential wasp or bird issue if you found a piece of the caterpillar…they can sneak in/out pretty quickly. Ok thanks. You are prob right but out of curiosity do larger monarch cats eat smaller ones? I have seen no evidence of any birds and never have seen a wasp either and the plant was undisturbed so it’s all a mystery. It was a caterpillar. I found out the hard way. I moved a smaller one onto another plant where there was a larger cat sleeping thinking it was ready to pupate due to its size. Plenty of plant left and large enough space. Within an hour he was eating the smaller caterpillar. I had no idea they did that and wouldn’t have moved the smaller one had I known. Not sure what else I could have done since I moved it in order to have more plant to eat. I have been infested with small white/yellow spiders this year, I live in San Diego. The more I try to get rid of their webs with a large bristled brush, the more I feel that I am spreading them around the garden. I feel for the little caterpillars as I have also been bit numerous times on my eye lids and face. Is there some form of non-toxic formula you know of that will aid in the reduction of these tiny little arachnoids without harming the caterpillars? We have a lot of large black ants on our milkweeds looking for aphids and taking caterpillars instead. I actually found a solution but the caterpillar needs to be checked at least once if not twice daily. I made drawstring bags of sheer fabric left over from my daughters wedding dress. The material is tightly woven so nothing can get through it. I tie the bag over the milkweed leaf or branch of leaves and move the caterpillar as those leaves get eaten. When a chrysalis develops I cut the branch and put it safely inside so it doesn’t hatch out and get caught in the bag. The fabric is sheer and dries quickly. I still have some that I’ve used for three years and they haven’t rotted yet. Really works nice. Hatched out 57 monarchs last year with a goal of 75 this year! This is just what I want to do, too! Was looking to see if anyone sells those mesh bags so I could try them out, but haven’t found any other sites mentioning putting bags over the milkweed outside to protect the eggs and little cats. I am so excited that I have monarch eggs in my yard for the first time ever, and I love the idea of letting them stay outside and just move the bag around with them as they grow, to keep them safe from predators. If anyone knows of anyone who sells wasp and fly-proof bags, would someone please post their web address? Thanks!! I live in Northeast Florida. I have lizards in my yard that will eat the butterfly eggs just as soon as the eggs are laid. Is there any way to drive the lizards away without killing them ? Hi Jim, lizards are a big problem in your region. The plants would need to be covered or in a place lizards couldn’t access (do you plant any milkweed in containers? ), or try raising a few indoors. I’m not aware of any safe methods to repel them. 2 Days ago, May 1, 2017…I finally had monarch caterpillars on my milkweed after waiting and hoping for 2 years. There were about 6 tiny caterpillars munching away and I was dancing a monarch dance, thankful that I finally had success-but yesterday, May 2, when I got home from work they were all gone. Not a single one left and I can say that it honestly ruined my entire day. The only bug I found on the plants other than the caterpillars were earwigs. I didn’t realize earwigs bothered anything. Could they have eaten my baby caterpillars? How can I prevent that from happening again? What if no other monarchs come and lay eggs this year? Btw, I live in extreme North Georgia, 25 miles or so from the Tennessee state line. I’ve known I had a lot of earwigs around our home but I never dreamed they would bother monarchs. I don’t like killing any bugs or spiders and I also don’t like using pesticides but earwigs have really upset me this Spring so I need to figure out a way to keep them OFF my milkweed. I did run across something strange today. I have a natural milkweed patch, and have quite a few whoppers crawling about. I happened upon one that was writhing and curling its head, as if it something were hurting it, or it had eaten something really nasty. Looking more closely, I found a earwig right under the path of the caterpillar. From what I could tell, the worm had bumped into the earwig. Maybe they put out some foul substance when disturbed. I plucked the earwig off, and now the worm is resting under a leaf. I thought the ‘wigs were harmless, since I never had a bad infestation, but from now on, I’m going to do away with any that I see. My theory is that perhaps the earwig emitted something when the worm chanced upon it, though I can’t find any info online to confirm this possibility. Well, it was a big worm, seems to have moved on, hopefully to pupate. Have you seen a worm behave as I described? Obviously distressed, almost as if it had eaten something nasty. I am so glad I finally found your website. i have been raising Monarchs for 5 years and every year I fight wasps. I have tried every “natural” repellant available and even poured ground cloves all over my butterfly garden last year. I was just outside and saw that one of my big caterpillars was stung by a wasp. Always makes me sad and can’t believe it is so hard to become a butterfly. Can you please give me some options for getting rid of the wasps all together. i know the balance that all should exist together… I’d rather have my honey bees and beautiful butterflies. thanks…. any and all options are welcome. Snails. My cousin bought me a few milkweed plants for my birthday. She lives within 10 miles of the ocean (we are in California) and I live 50 miles inland. We don’t really get snails out here but my plants have several tiny snails on them (My assumption is they came with the plant since snails are so rare out here). Are they going to eat the butterfly eggs or should I just let them be? I am pretty sure they have been eating the plants because a few leaves have holes in them but there have been no caterpillars on them. Hi April, everything is innocent in our garden, until proven guilty…so if snails aren’t typically an issue and you have a good milkweed supply, I would let them stay. I have never heard of snails eating monarch eggs, but I suppose it’s possible. A healthy ecosystem in your garden contains both monarchs and their predators. If you want a few more to survive you can always cover a couple plants with netting or raise a few indoors. How do I get rid of red and black small beetles? They are massacring my milkweed plants…help. Hi Leona, manually is the only solution I know of…flicking them into a bucket of soapy water. good luck! I planted mint arund our milkweek in the thought of warding off the wasps… My catapillars have all left the milkweed and are all resting under the mint leaves. Do they eat mint? Will this harm them? Hi Donna, monarch caterpillars don’t eat mint. If they are large enough, they could be looking for a place to pupate. i’m not sure what kind of mint you planted, but we removed mountain mint plants because they attracted a lot of wasps. After posting this, they all crawled back into the milkweed and were destroyed by the wasps. I was able to save three. The past three cycles i have had, the butterflies did not hang to dry long enough, and i was finding them on the ground with folded wings. I assumed it was either a cold snap we had, or the wind…. I planted mint from the shelf at Home Depot, here in FL. I guess i will be moving it. Home Depot sells many plants that have been treated with neonicotinoids (pesticides). I don’t know if that could be part of your problem or not. If you buy plants there, read on the label. Treated plants are labeled. I had 6 crystales hanging from plant pots. Yesterday 2 of them were getting dark and ready to open. This am they were all Gone! Not even an indication that they ever existed. What could have happened.? This never happened before. Hi, sorry to hear this! My guess would be a larger predator snatched it like a bird, mouse, or lizard. WE LIVE IN AN ALF AND WE ARE RAISING MONARCHS BY PUTTING THE POTTED PLANTS IN OUR LITTLE GARDEN BUT THE FROGS AND LIZARDS ARE EATNG THE CATERPILLARS. WE’VE SPRAYED AROUND THE AREA BUT IT HASN’T PROVEN AFFECTIVE. THEN AGAIN WE HAD SO MANY CATERPILLARS THAT THEY HAD NO FOOD SO WE BOUGHT MORE PLANTS FROM A DIFFERENT PLACE AND WHEN WE TRANSFERRED THEM TO THE NEW PLANTS THEY WOULDN’T EAT THEM AND THEY DIED. ANY SUGGESTIONS? Also, make sure you are buying plants from a pesticide-free grower. It’s a could idea (if possible) to try and establish a large milkweed patch before raising monarchs…good luck! Please don’t spray poison. What is the point of doing anything for the environment or for nature if you are spraying poison? Do you have any suggestions on what to do for birds? Once they discovered the caterpillars, I have had an incredibly hard time getting any to the butterfly stage. Hi Van, are these bird species that would feed on seed from a feeder? If you offer them something more enticing, they might leave the caterpillars alone. Otherwise, you could cover some of the host plants with netting. good luck! My milkweed plants always attract aphids. How should I get rid of the aphids without harming the monarch cats? Are aphids harmful to cats? Are they harmful to the milkweed, or should I just leave them alone? I’m a nubee monarch raiser! Aphids will not Harm Monarch Cats However they do hurt the Milkweed that your cats are trying to feed from, my advise is to collect all of your monarch cats and use soap and water to kill the aphids on your plants it will suffer ate them and they will die and rinse it emit ly after you are done with soap and water. Use water to rinse the soap out. I had this problem with my milkweed to. Lady bugs eat aphids and some one told me if you don,t want the aphids to come back use ferterlizer. 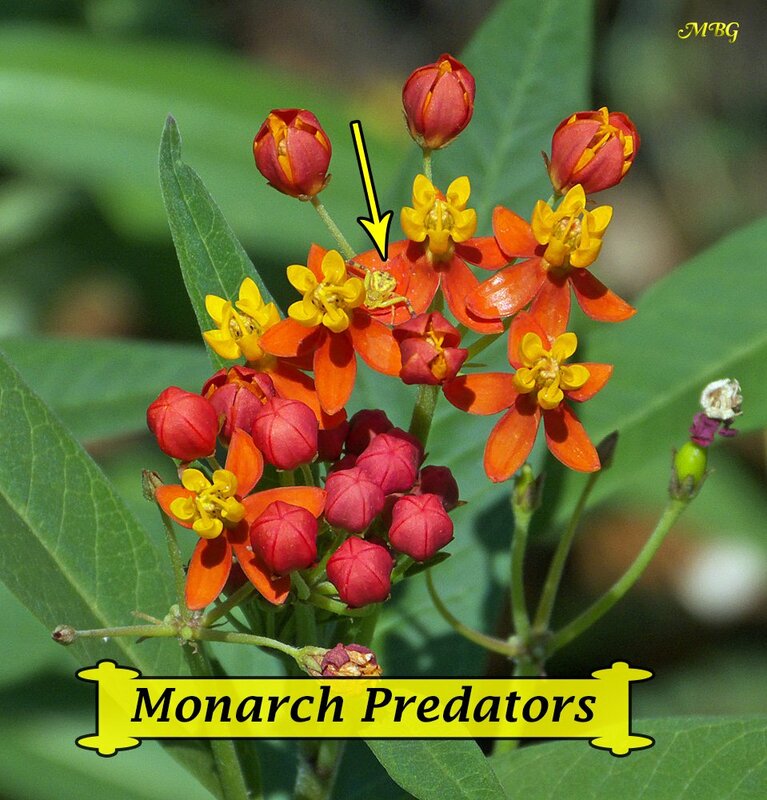 Hi Will, the monarchs have many predators in the butterfly garden, as you can see listed on this page. Some will survive outside, but you can help boost their numbers by raising a few indoors. I am brand new to raising Monarch butterflies. I bought a milkweed plant and amazingly found 5 very large caterpillars. Unfortunately, I only found one chrysalis, so I wonder if the other caterpillars were not eaten (I had assumed not because of the toxins, but I am learning how predators adapt). The other day I was crushed to see my chrysalis is gone – the leaf is still there but something took the entire chrysalis. Ever since I saw the caterpillars I thought I should bring them indoors and get your kits to raise them inside. But I thought nature was smarter and they would do better outside. Now I regret not getting the kits to save at least the last cat. Since I am writing at the end of September, do you think I should buy your kit now or wait until next year – in the late winter for next spring? I don’t want to just keep the kit at home during the winter if there is no need. Plus, I doubt an eggs will develop into caterpillars at this point – do you agree? Hi Laura, I’m not sure how long warm weather will last in your region. You should be able to release well into October if you find a large caterpillar or chrysalis, but it’s too late for eggs. Unfortunately, monarchs have many predators. You can’t save them all, but even raising a few indoors can make a difference. My first experience in planting giant milkweed. We live in Spring Texas, we discovered the plant we purchased had a small monarch caterpillar. We’ve watched him grow larger every day, he grown quite large over a week and a half 10-11 days). We have blue birds feeding in the area, I feed them dried mealworms away from the plants. This morning my large caterpillar is missing! I know it’s the natural ecosystem but can you tell me what may have had my caterpillar for dinner? We do have a number of lizards around and baby toads. I suspect it was a lizard! I suppose I needed to bring him in a protected area. Your site has been quite informative, too bad I didn’t find it before he was dinner. Tony, we found her on a near by plant in the “J” formation. We brought her in and made a makeshift netted cage. She immediately went into a chrysalis. She has since emerged and set her free.. not I have released three.. with two more cats and one chrysalis on the Giant Milkweed leaf in the yard. A healthy monarch caterpiller spun it’s chrysalis on a planter today & I went to check on it. It was pulled off, only the silk remained. What creature would pull it off? I live in SW Florida. We have small lizards here. Sorry to hear this Carol, lizard is a definitely possbility! I have been raising them from eggs on my lanai also. I don’t think they go through the migration to Mexico since we have warm weather most of the year. Would you suggest cutting down all the milkweed in late November or so. Moved to Florida last September & I’m not sure what to do. Hi Carol, milkweed in continuous growing regions needs to be cut back at some point so OE spores and bacteria don’t build up on the plants. You can stagger cuttings so there’s always some milkweed available. Hi, I’m from Mexico. I have been raising monarchs for 2 years. But this year it’s been a disaster. The flies are killing all the caterpillars. I made a little house to raise some indoors, but these flies always find the way to get in, I dont know what else to do. If you bring in eggs and keep the cage fly-free, they shouldn’t be a problem…good luck! I really need help with Aphids! They are killing my milkweed. Hi Stephen, I’ve heard of this and new/unexpected issues is always a concern when using biological pest control (which is why I’m not a fan). Hopefully these parasitic wasps don’t decide to go after monarchs. Hi Tony I have a plate of fruit (melons and apples) outside for the butterflies which they love. Problem is so do the yellow jackets and wasps. Is there any way to get them off the plate so the butterflies can eat in peace? Hi Yvonne, none that I’m aware of. Please post a reply if you figure out a solution! Monarchs aren’t the only insect that needs a helping hand. Is it wise to only save our favorites? The entire milkweed community, predators and all, are welcomed in my gardens. Predators are a fine way to manage pests in the garden and a far better solution than using insecticides and fungicides, which can kill our favorite species, too. It’s about restablishing a balance, not just picking and choosing what’s “worthy” of saving. Hi Laura, if you take the time to read my blog, you’ll see how a monarch focused garden supports lots of other wildlife. Diatomacious earth is a good option for controlling bugs with exoskeletons, and most likely won’t harm the caterpillars. Thoughts welcomed! Hi Dawn, not good if a caterpillar crawls over it! I would not suggest using it near any host plants. I live in West Los Angeles and have many milkweed plants.Last year I had at least 50 caterpillars and released a couple dozen monarchs. This year I see lots of monarchs but only a couple caterpillars. I have noticed lots of large & small assassin bugs and have been trying to kill them as they may be eating the caterpillars. Any type of bug spray I can use that won’t harm the caterpillars? Hi Paul, unfortunately no. Planting several types of milkweed and spacing out your patches can help more monarchs avoid detection from predators. Bringing in a few inside to raise also makes a difference. good luck! I also live in Los Angeles, and last year we raised 150 monarchs off roughly 15 milkweed plants, some in the ground and some in containers. We had to transfer cats on to a rotation of milkweed plants in a zippered pop up tent where the cats could grow, eat, and eventually cocoon. Without the tent we could only raise a handful this year, sadly. Be careful when buying milkweed. Only buy plants that have caterpillars on them. For ants, I’ve had good luck with corn gluten meal. I use it in spring, as a pre-emergent for weeds/crabgrass, as it’s supposed to be safe for birds and the earth. Ants like it, and it is supposedly not good for them. I’ve seen a decrease in my ants since using this method the last several years. With hummingbird feeders, I was also attracting ants (even though they couldn’t reach my feeders with ant moats), and this also helped with the fact they were occasionally congregating and occasionally crossing the threshold into the house. I live in FL, besides the wasps & ants, I have a problem with the Geckos eating the eggs & caterpillars. Do you have a solution to that????? HELP! Hi Mary, you could always try some netting over the plants, but the most effective solutions are spreading out your milkweed patches or raising a few indoors. Hi Tony! I started raising monarch this year, and I’m happy to have lots of caterpillars in my milkweeds! !…but, the caterpillars are dying just at the moment they try to become chrysalides, they starts to change their colour to black, and they make strange head movements, after that, they died…what do you think it is? Could be a disease?…I tried to raise them indoors and outdoors with same results. I just read the blog and I think it is the tachinid fly…. 🙁 … I’m going to save my caterpillars from them….. Thank you very much!!. Hello Herlinda, during the summer months much of the population is further north where there is more fresh milkweed. However, there could also be predators in your garden. Milkweed beetles are herbivores so I wouldn’t worry about them. Wasps, ants, spiders, lizards, etc….unfortunately, there’s a long list of monarch predators…raising a few indoors definitely helps. Thanks Tony. I will try to save the eggs when I see a butterfly on the flowers. I do have a boarding house that I use for nursing the catepillars when I catch them on time. I’m also experiencing quite a few catapillars that don’t make it to the chrysalis, they hang straight with a string hanging and they look like life was sucked out of them. That is a tachnid fly host. I just lost 2 cats today from that. July 5 2016, I have yet to see a monarch up here, or find a caterpillar or egg. We had an unusually wet June, receiving over 7″ of rain, would that wet June play a part in this? West-Central MN: These red bugs (about 1/4″-1/2″ long) have INVADED my milkweed plants! Orange and black ones, too. How can I get rid of them without hurting the monarch eggs, caterpillars, and milkweed? I have good pics but don’t know how to attached them here. Hi Tony. I think I posted this last year on The Beautiful Monarch page on Facebook. Use coffee grounds, recycled works fine, not decaf, in your dirt around your milkweed. Ants depend on their scent trail to survive and make it home, there’s something in coffee grounds that disrupts their trail or scent so they avoid coffee grounds. Grams used it in her flower beds and veggie garden. Thank you Roberta, I added your info to the ants section of the page! We set up a “Bee and Insect House” in our milkweed garden. Will the bees and insects that may visit that house bother butterfly eggs and caterpillars? Bees and butterflies peacefully coexist in my experience. It’s the wasps, spiders, tachinid flies, some lizards,and more that you need to be wary of…it’s much easier to bring a few eggs/caterpillars inside to raise then worry about all the potential predators outside. good luck! If I hang wasp traps, should they be close to the patch of milkweed in my garden, or a bit further away? Also, I think I read somewhere that they may need protein right now, and juice later in the season. Is that correct? Hi Amy, wasps typically use monarch caterpillars to feed their larvae early in the season, but feed on nectar otherwise. At least that’s how it works with the wasp species in our Minnesota garden. We have not used traps before so you might want to check another resource with first-hand trap experience…good luck! Will swamp milkweed do well in part sun/part shade or should I try poke milkweed? I was considering adding mountain mint to the butterfly garden but have read it attracts tachnid flies and wasps as well. Should I avoid planting it? Hi Chris, either variety grows well in partial shade. We have some poke right next to our swamp. Our swamp patch has thrived in partial shade (gets afternoon sun)…I will get a better idea about the poke next season. It was mowed down by rabbits in 2015. It did get a fair amount of eggs before they found it. Swamp milkweed is a heavily used host and nectar plant. As for mountain mint, I dug ours out a couple seasons back because all I ever saw on it was wasps. Wasps repeatedly attacked smaller caterpillars on my Giant Milkweed. I tried to swat them away, but another would come. Only on this plant did the wasps/yellow jackets attack my caterpillars. We get a lot of “mud wasps” and knock down their beginning nests as soon as we see them. We live in a rural area, so it is hard to tell where they are coming from. When I can, I place potted milkweed into Butterfly castles and protect them. Then you have to watch for the ants that will attack the chrysalis! 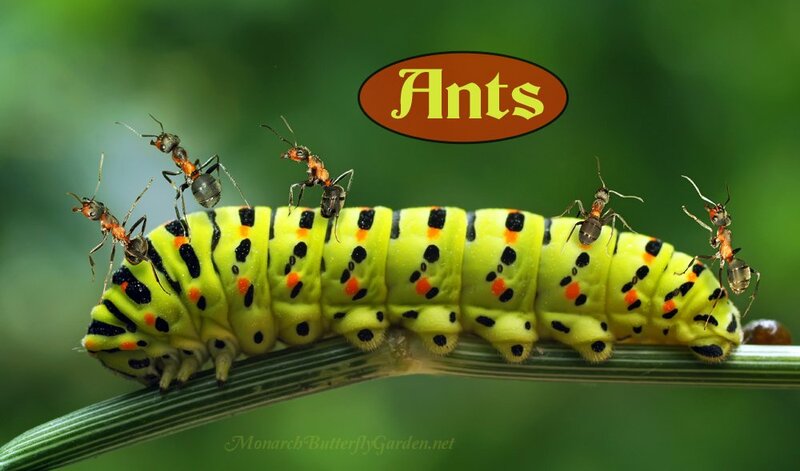 Hi Vicki and thanks for sharing your experience…I was not aware that ants eat chrysalides too, but it doesn’t surprise me considering I never see them in our garden. We typically raise monarchs in our 3 season porch where predators aren’t an issue. I will definitely add some info about ants to the predator post soon. My biggest issue with ants is that they eat the eggs. Not one that I left outside last year survived. The ants are terrible around my property. They are literally everywhere. I tried clove oil at first as an organic solution, but no one could afford that much clove oil. This year I’m thinking I’ll mix borax and water and just poison them all, but considering this battle has been going on for years, I’m prepared for defeat. Hi Jessica, so sorry to hear this. I have heard that people have success with the borax mix, and I will research that thoroughly before I add the ant info to this post. Hopefully this will be the year you outsmart those pesky ants! Somewhere I read dill pickle juice works on ants or plants. I couldn’t remember which so my sweetheart tried it on ants and a weed. Ants gone and weed alive. He applied at room temperature. So if it kills ants, maybe it will be okay for plants and milkweed. We will test further. Thank you for your great info! Hi Renee, I typically don’t recommend foliar treatments because they might keep the monarchs from using the plants too. You can always try it, but if you don’t see monarchs using the plants or find eggs, I’d try an alternative method…good luck! I found that if I grow a stand of milkweed but also keep some ‘lone’ plants (single plants spaced at least 3 ft from other milkweed) that predators focus on the eggs/cats in the stand and those laid/emerged on the isolated plants are more likely to go undetected.